More than 190 golfers and 40 volunteers turned out for the 29th annual Benefit Golf Tournament on August 19 at Bent Creek Golf Course in Jackson. The tournament raised more than $178,000 and will provide free valet parking services for Saint Francis Medical Center patients and visitors. Winners of the morning championship flight were sponsored by Perry County Memorial Hospital: Patrick Carron, Tim Brewer, Don Fulford and Steve Rozier. Ohlson Lavoie Collaborative sponsored the second-place team: Hervey Lavoie, Mark Miller, Dave Babcock and Darrell Koenig. W.L. Gore & Associates sponsored the third-place team: Paul Hoog, Dave Rotolo, Dr. Colleen Moore and Mark Moore. Concordance Healthcare Solutions sponsored the winners of the morning “A” flight: Dale Behlmann, Darrin Werner, Dan Rieman and Bridget Grotts. GreenPages Technology Solutions sponsored the second-place team: Kevin Probst, Heather Probst, Eric Ticer and Pat Elfrink. Third-place winners were Jake Groff, Lauren Pennington, Dr. Matt Gaeta and Dr. Ray Silliman. Winners of the morning “B” flight were Dan Atkinson, Buzz Atkinson, Jarett Stafford and Steve Taylor. Carns Financial Services sponsored second-place winners Dan Carns, Dr. Wendi Carns, Zach Green and Kelly Green. Mississippi River Radio sponsored the third-place team: Christy Benton, Mike Renick, Ed Groves and Todd Bonacki. The Bank of Missouri sponsored afternoon championship flight winners Aaron Panton, Dr. Kate Barnette, Ross Barnette and Nick Harter. The second-place team was sponsored by Cape Radiology Group: Ian Soutar, Ken Swinford, Ben Cantrell and Brevin Giebler. DeRoyal Industries sponsored the third-place team: Ron Harris, Bill Tegel, Ryan Tegel and Austin Putty. 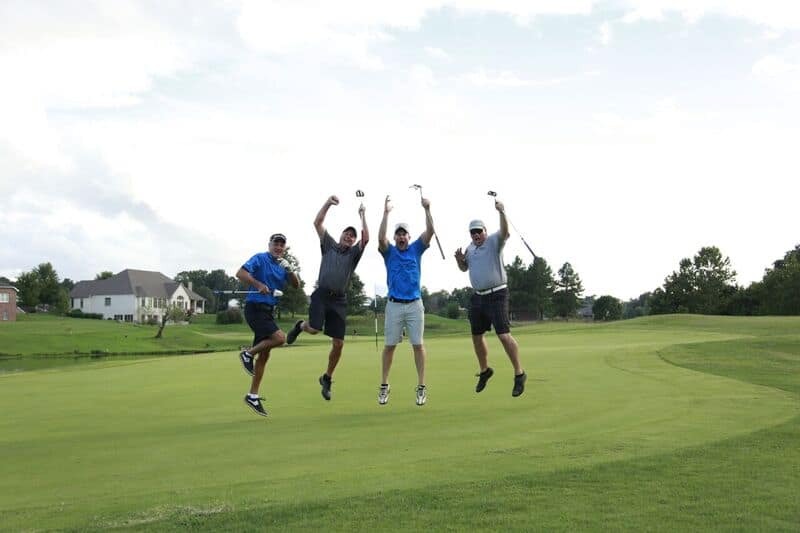 Winners of the afternoon “A” flight were Dan Atkinson, Matt Clabaugh, Joe McLemore and Matt Hollis. Richardet Floor Covering, Inc. sponsored second-place winners Dave Richardet, Jon Paulas, Jesse Richardet and Corey Lorenz. Eye Consultants, Inc. sponsored third-place winners Dr. Todd Lumsden, Janice Lumsden, Dr. John Kinder and Stacy Kinder. Otis Elevator Company sponsored afternoon “B” flight winners Kayla Johnson, Kaitlyn Johnson, Mike Mosella and Aaron Bagley. The second-place team was sponsored by Kerber, Eck & Braeckel, LLP: Tony Balsano, David Prather, Amber Halstead and Mariana Godinez. The third-place team was sponsored by H&R Alarms, Inc.: Terry Scholl, Rick Fehr, Jay Moore and Alex Martin. The Friends of Saint Francis, formally organized in 1975, assists Saint Francis Healthcare System Foundation in providing patient services and financial assistance to Saint Francis and the community. Since its beginning, The Friends have given more than $3.7 million in support of Saint Francis Healthcare System. The Friends Board is composed of people from the community and employees who are committed to serving the Healthcare System in an active way. The Friends support the Healthcare System, its patients and their families; give back to the community through service; and transform lives for the better.